When I moved into my room in Pforzheim pretty much exactly a year ago, I started from scratch. Literally, because there was not a single piece of furniture! The first night, I didn´t even have lights in my room, so I spent the evening in the hallway (the only room with light) on an air mattress and watched a DVD on my laptop because, of course, we didn´t have wifi either - so glamourous! But a lot has happened within the last 12 months and I can truly say that I love how my room turned out. It is very light and airy and can both be productive in here as well as relax on the bed with some Netflix or a good book. Even at in the beginning, when my room was far from being done, a lot of my friends who visited loved the way I decorated the space and how I made it feel homely within only a couple of weeks. Now, I am defenitely not KateLaVie (her interior style is to-die for! ), but I love decorating my own room, making it both comfy yet beautiful and a space where I can feel at ease. To demonstrate the impact of my following tips, I thought it would be best to decorate this space step-by-step. I actually just finished this little corner in June! 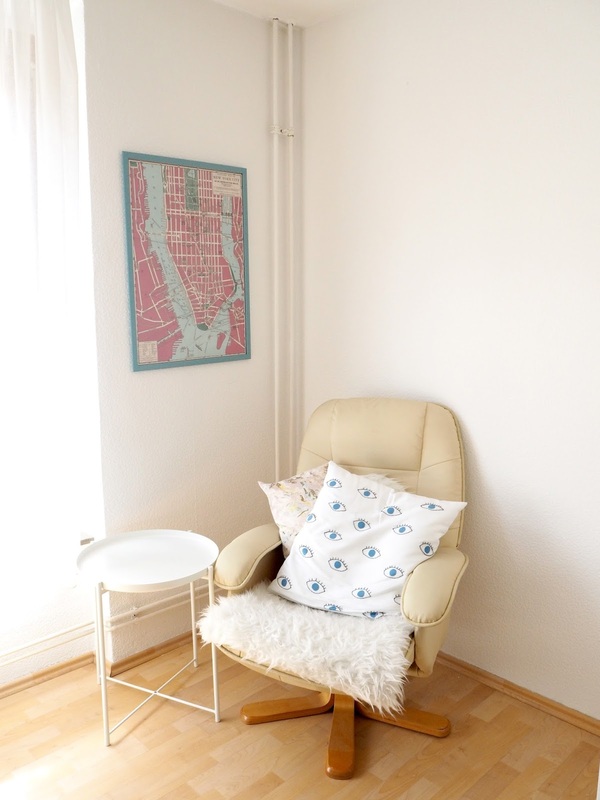 For the longest time, it was just the armchair with the white fake fur and a pillow on, but when I found a print in Munich, and the side table on the way back home at IKEA, it all came together quite quickly. I´ve had the armchair for years in my old room and when I moved out, I had to take it with me! 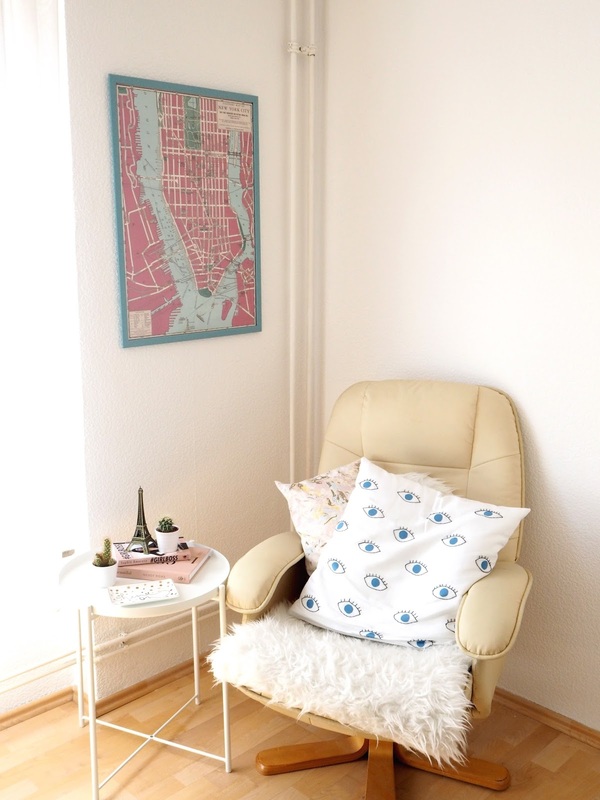 It´s so comfy and perfect for reading! The easiest way to instantly make a space feel more comfy is to add some textures / textiles through cushions, throws or (fake) furs. Because the leather of the armchair is quite marked on some places (especially the seating area), I wanted to cover that by adding the white fur from IKEA. 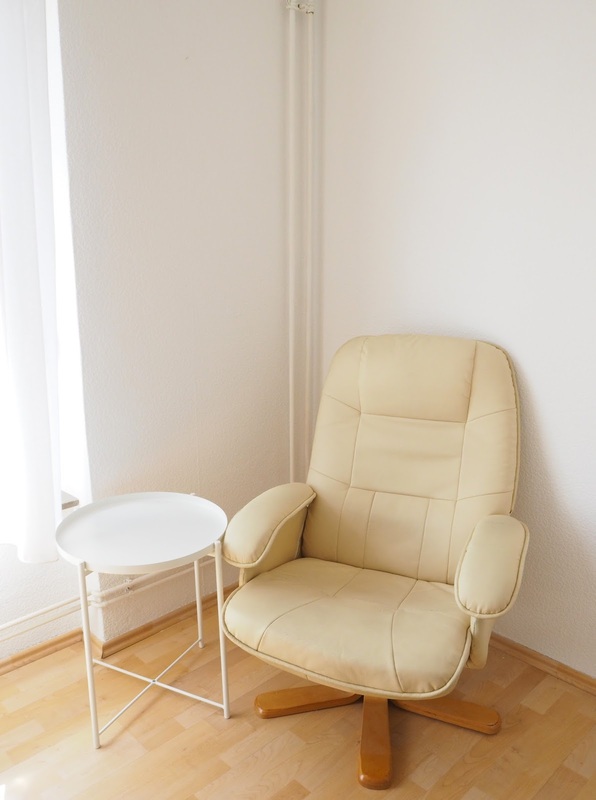 I´ve had it for ages and I think it works really nicely with the armchair and cushion. 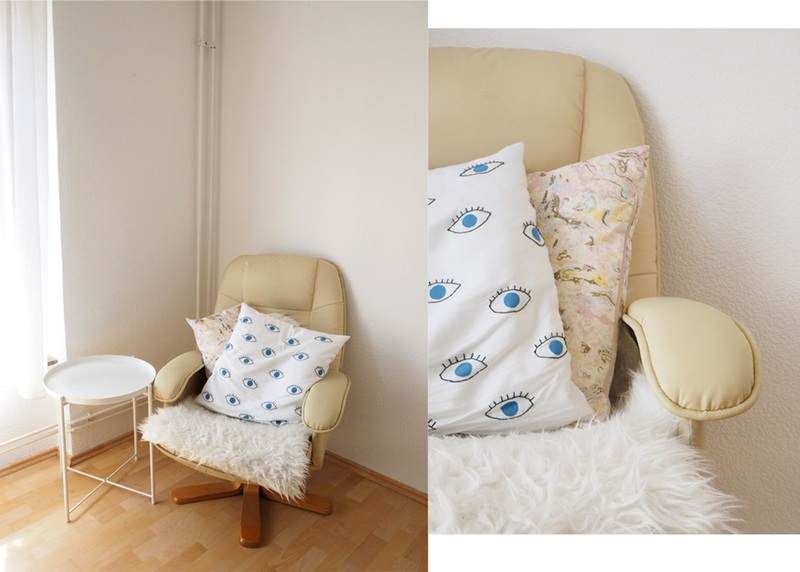 To make things a bit more comfy but still stylish, adding some cushions is always a great idea. This eye pillow is actually a DIY I made last year (find the step-by-step guide here) and I love the look of it. 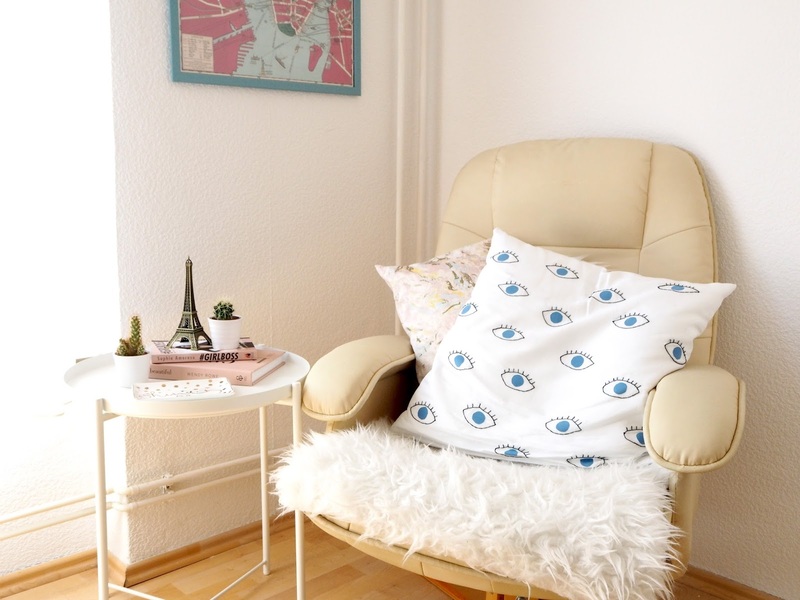 In general, cushions are great to add some patterns, textures and colors to a space without being too expensive and you can always change things up really easily (H&M Home is great for affordable cushion covers!). Adding walldecor and prints might make the biggest difference! I have a huge love for any prints, but most of the time, they are quite pricey. I found this map of New York in a store in Munich and it was only 1€ (!!!) 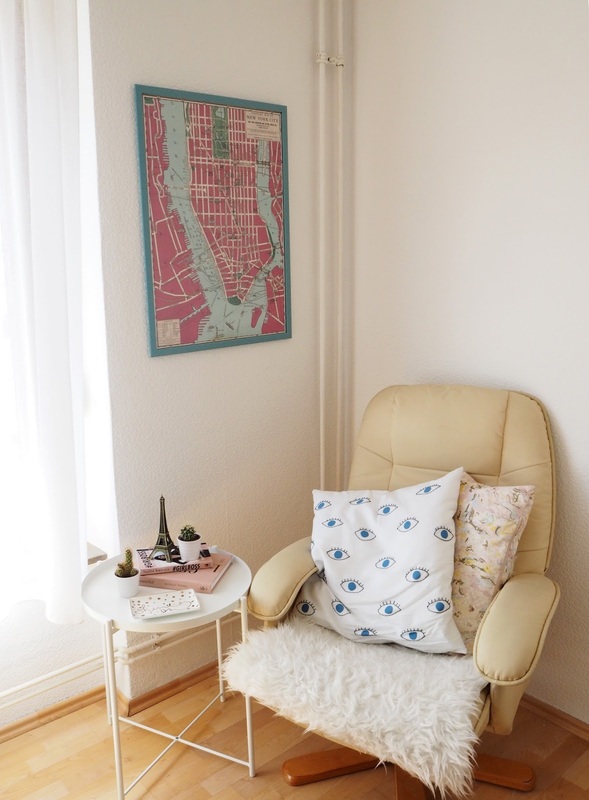 and I think it is perfect for this little corner as it adds some color to an otherwise quite white space. 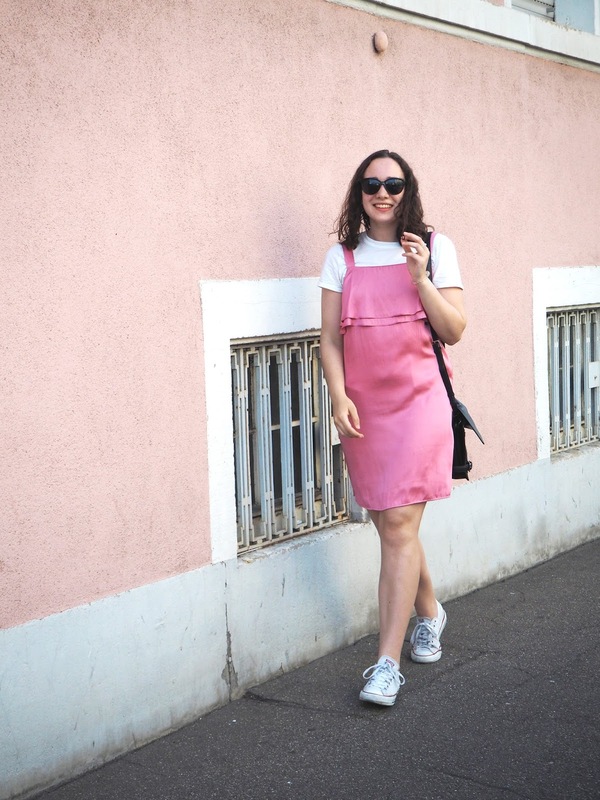 Plus, I love New York and pink as well (obviously)! I also have a gallery wall next to my bed, which I might show you once I am back in Pforzheim (are you interested in seeing that?). 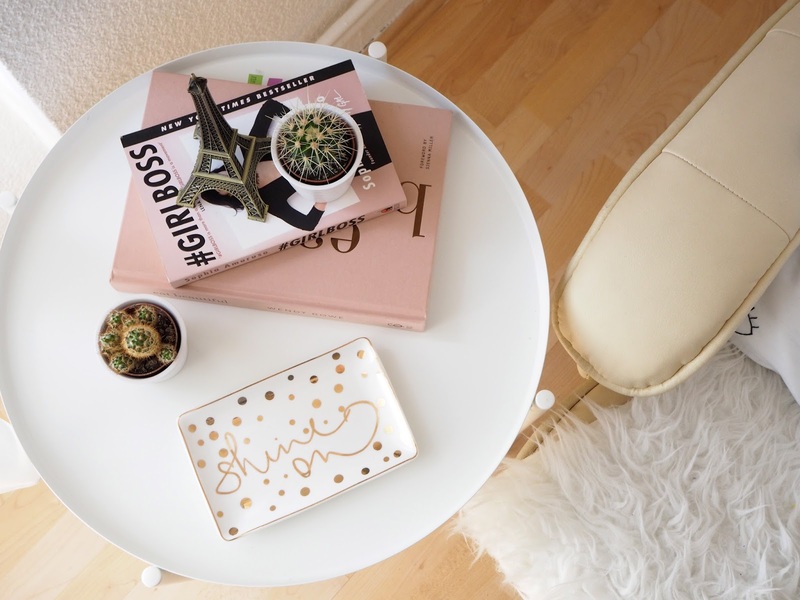 In general, prints and walldecor is a great way to make a space more homely, because it immediately pulls a space together and adds some life and color as well. To add a personal touch to a simple side table or some shelves, styling it with some books and some trinkets is the way to go. Now, KateLaVie is defenitely the queen of styling shelves, so you should defenitely check her out and this post she´s done on mastering open shelving. You can learn so much more from her than from me! 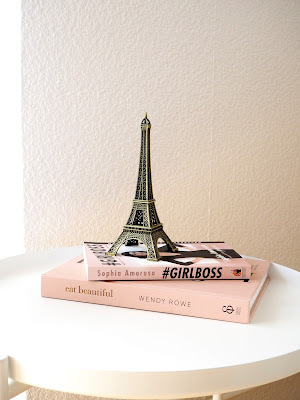 However, I like to use color-coordinated books - that´s when my love for beautiful blush pink books comes in handy- and add some gold accessoires like the Eiffel Tower in the picture or a little tray. Last, but not least, adding greenery is perfect for making a space homely, fresh and cozy. Since I have the un-greenest thumb known to man, I am sticking with little cacti I got from IKEA, but I would secretly love to get a monstera plant to place it next to the armchair - however, that has to happen in my next life when I have a greener thumb, because otherwise, I´d probably kill it within only 6 weeks time (that has happened already twice!). 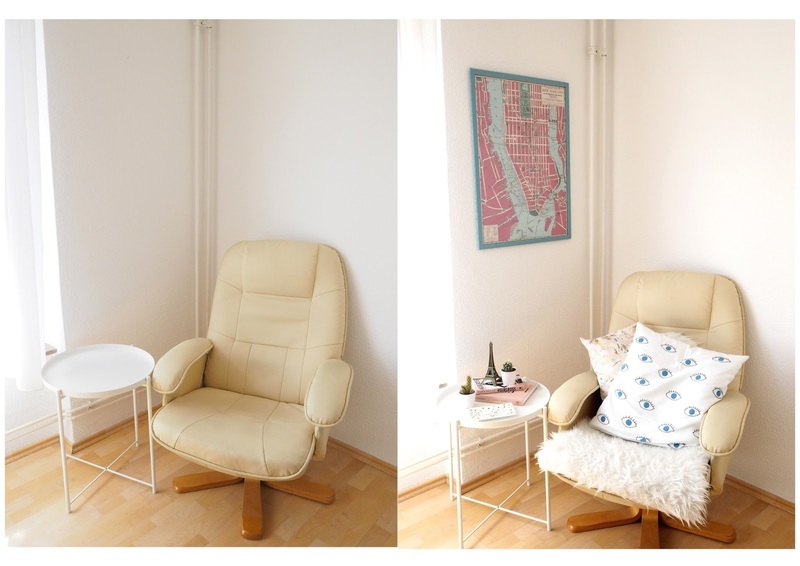 I think it´s amazing to see how such small (and affordable) changes can make such a huge difference to a corner, don´t you think? Love the tips. You made it beautiful!